As the winter sun sets on the snow-covered New England town of Thunder Island Falls, horse-drawn coaches, bedecked with wreaths, bring last minute arrivals home to share the holidays. The wintery setting with its bare trees and snow and icicle-covered buildings come alive with a festive air in preparation for the big Christmas celebration. 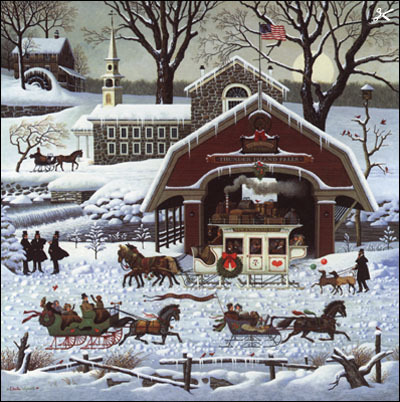 "Twas the Twilight Before Christmas came about through my present preoccupation and fondness for the romantic Victorian period of our country's history," says Americana artist Charles Wysocki. A slow, relaxed Christmas snow scene seemed like just the ticket to convey my feelings for the leisurely paced hustle and bustle of a small town during the holiday season." 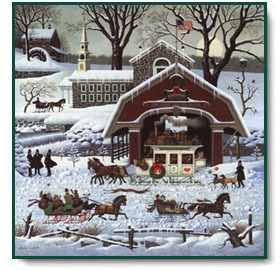 1987 Christmas Print: 'Twas the Twilight Before Christmas copyright © 1987 by Charles Wysocki.